Lights, colors … stained glass with a backlight. And not just Christmas, but several festivals throughout the dark half of the year, from Halloween through Easter. Big enough to be viewed from across the street, but small enough to take indoors for reworking. Challenge accepted. Full-spectrum color — The rich colors of the glass would come through nicely, I hoped. The stated 5000K color temperature is pretty close to daylight. 650 lumens brightness — about as bright as a 60-watt incandescent bulb, plenty for night-time displays. But because it uses LEDs, it actually burns only 8½ watts. Suitable for wet environments — Sure, I'd put it in a weatherproof box, but with outdoor stuff you can never be totally sure it will stay dry. Dimmable with standard dimmers — Not an immediate need, but nice for possible future modifications. Step two: Build the box. Cheap quarter-inch plywood, covered by several coats of paint, seemed adequate. 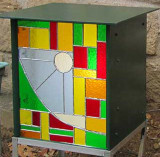 I made the bottom panel removable, allowing me to swap glass panels as the seasons change while (I hope) not allowing much water to get inside. 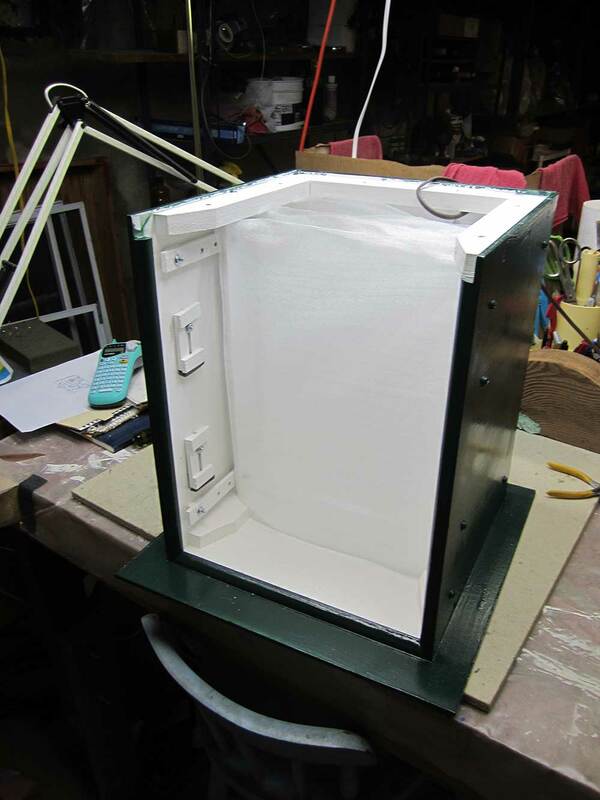 The only tricky part was spacing several sheets of thin white packing foam inside the box, in hopes of diffusing the light as much as possible. 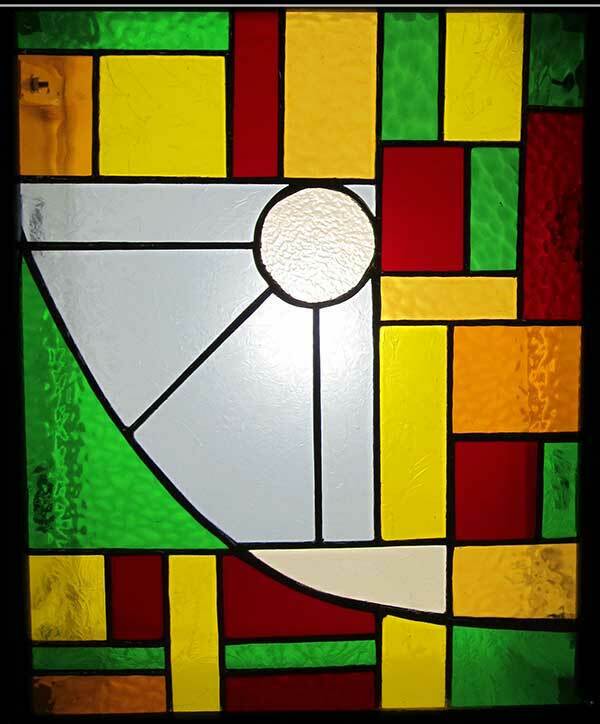 Step three: Design the glass panel. Actually, "design" isn't really what happened here; mostly, the process involved rooting through the leftovers from earlier projects to pick colors and textures that felt like Yuletide. In retrospect, I wish I'd used more red and green bits, with less yellow and amber. If that feeling persists, I'll make another panel. But that would entail a trip to the glass warehouse (100 miles round trip), so let's wait and see. Critique: The first few evenings the box was in service, I looked critically and saw that it definitely could be better. Aside from the quality of the design, or lack thereof, there were three annoyances. First off, despite four layers of light-diffusing foam, the illumination still had a hot spot in the center of the glass. Second, some of the glass colors weren't as bright as I'd expected, which suggests that the Cree bulb doesn't have enough output at those wavelengths. Third, a light that's bright enough at dusk seems way too bright late at night. In hopes of addressing all three of these issues, I sent away for a computer-controlled LED strip-light. That experiment is discussed on another page. Meanwhile, I continued to tinker. Adding a fifth, somewhat thicker, layer of light-diffusing foam helped a lot. The hot spot is no longer so obvious, and the late-night brightness is less annoying. In December, it seemed reasonable to do a panel for each of the winter festivals: Yule, Groundhog Day, Valentine's Day, St. Patrick's Day and Easter. But when I started sketching a Groundhog Day panel, I realized that the dominant figure would have to be a groundhog — a brown, round rodent. Dull color, indistinct shape, soft fur texture ... glass just wouldn't be the right medium. So I skipped right to Valentine's Day. 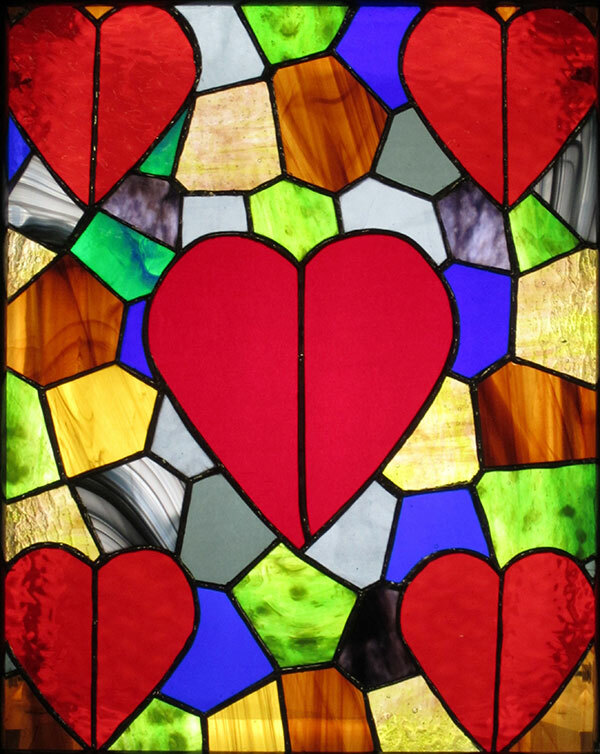 Valentine's Day is great for stained glass: big round red hearts over a jangly background of winter colors. The colors of winter, in these parts, are not snowdrifts and holly, but rather dormant grass, dead leaves and mud. So I used muted shades of gray, green and brown. On to St. Patrick's Day. 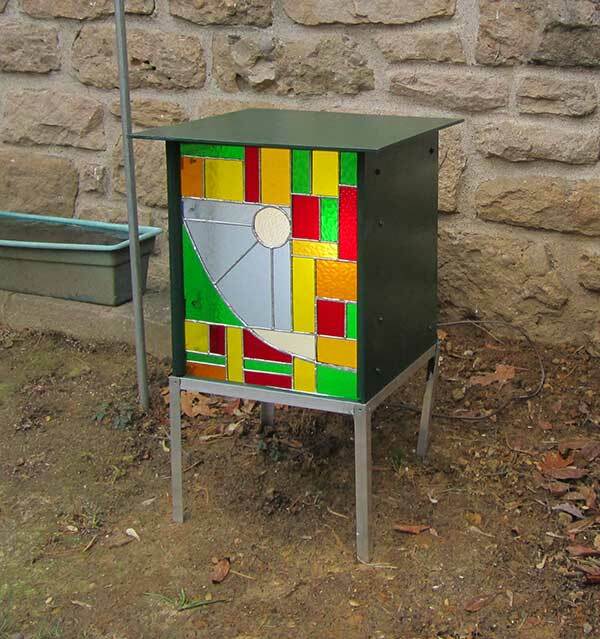 The obvious motif is shamrocks, and I even found a prefab bevel cluster in the shape of a clover. But after several tries, I couldn't come up with a drawing that didn't make me gag. 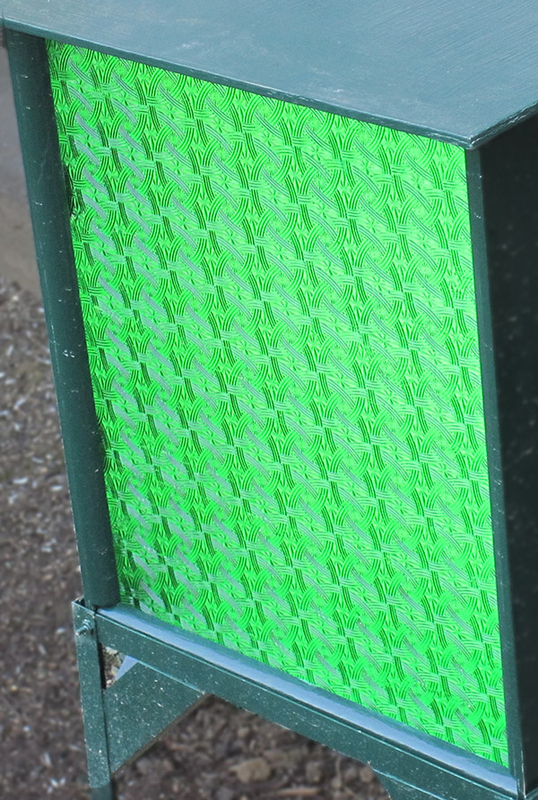 Fortunately, I also found a sheet of green glass embossed with a pattern of overlapping Celtic knots. And because I could not think of anything that would make it more Irish-y, I used it as-is. The last of the seasonal themes, Easter (lots of yellow, pink and purple), was designed using the computer-controlled LEDs described here.